This semi sheer white and dove grey top from Habella is a great summer piece. We love the crochet effect and cut out neckline detail. 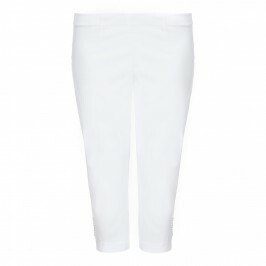 Team with white trousers and heeled shoes for a smart daytime look. Two in one silver and white openwork top over white t-shirt. Fabric 1: 96% Polyester, 4% Elastane. Fabric 2: 93% Viscose, 7% Elastane. Delicate Machine Wash - Reshape whilst wet.